I won't say too much about this book for fear of spoiling either this or the first book in the series. 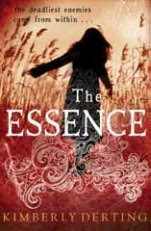 I must say I did enjoy getting back to the world of the essence and finding out more about Charlie's story. I do wish I had had the time to reread book one before starting this as I'm sure there were certain parts of this of the book which were lost completely on me. I did feel a bit like this title had a bit of second book syndrome about it which left me a little bit disappointed but I am still excited to read the final book in the series to finish it off. I do really enjoy the twist this series has in that the world at large is based on a matriarchal society and the historian in me loves all the tradition and bits at court. I liked getting into this book but felt like I had forgotten so much about the first that it wasn't as meaningful as it might have been. I wish I had been able to read them back to back.